Under ASF Wizard, select audio_sine_tone_lab from the Project drop-down menu. 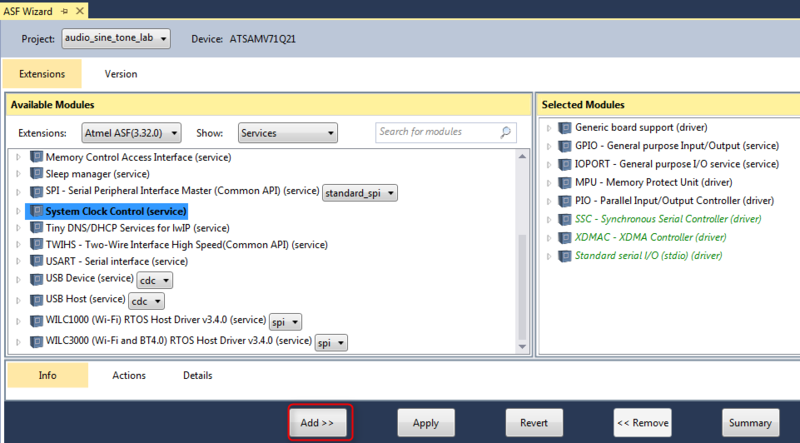 This shows the available and default selected ASF modules. Select Drivers from the Show drop-down list. 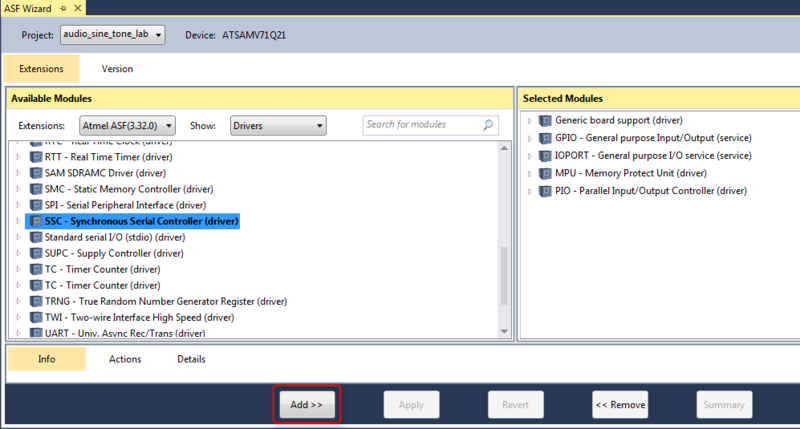 Select and Add Synchronous Serial Controller(SSC) (driver). The SSC driver is added to use the SAM V71 SSC peripheral. SSC is used for transmission of audio data in I2S protocol mode. 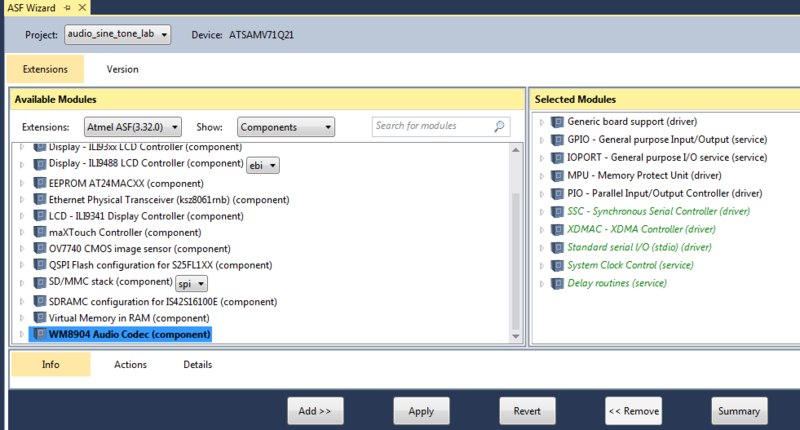 Select and add Extendible Direct Memory Access Controller (XDMAC) (driver). The XDMAC driver enables the SSC to transfer data without processor intervention while connecting over the I2S interface. 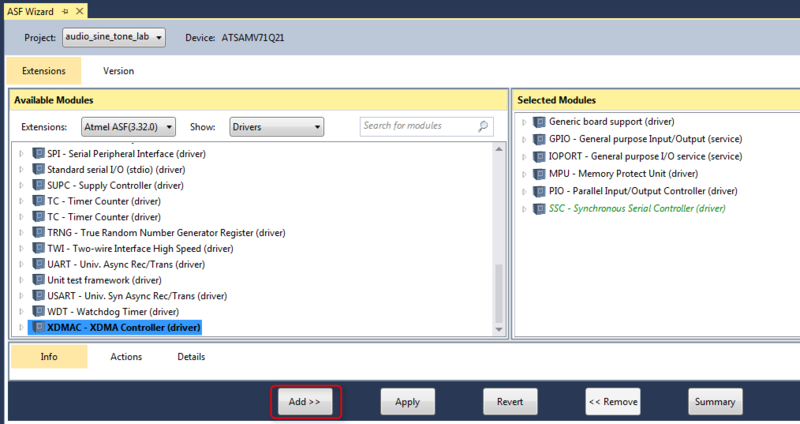 Select and add Standard serial I/O (stdio) (driver). The stdio driver uses the SAM V71 USART peripheral as a console to print debug messages. Select 'Services' from the 'Show' drop-down list. Select and add System Clock Control (service). The system clock control service is used to add the Power Management Controller driver (PMC) module. The PMC is needed to enable the peripheral clocks for SSC, TWI and XDMAC modules. Select and add Delay routines (service). The delay system service is used to perform delay operations. 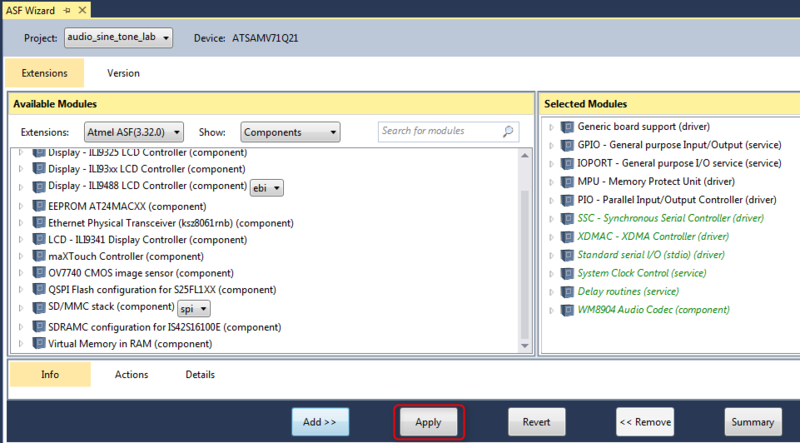 Select 'Components' from the 'Show' drop-down list. 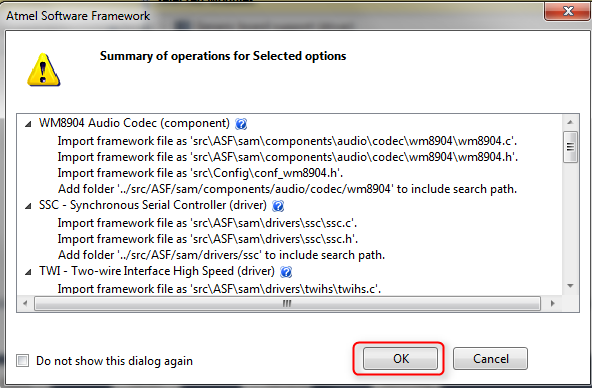 Select and add WM8904 Audio Codec (component). The WM8904 audio codec component is added to configure and enable the WM8904 codec module on the SAM V71 Xplained Ultra Evaluation Kit. This component provides APIs to configure and enable the codec as a master or slave. 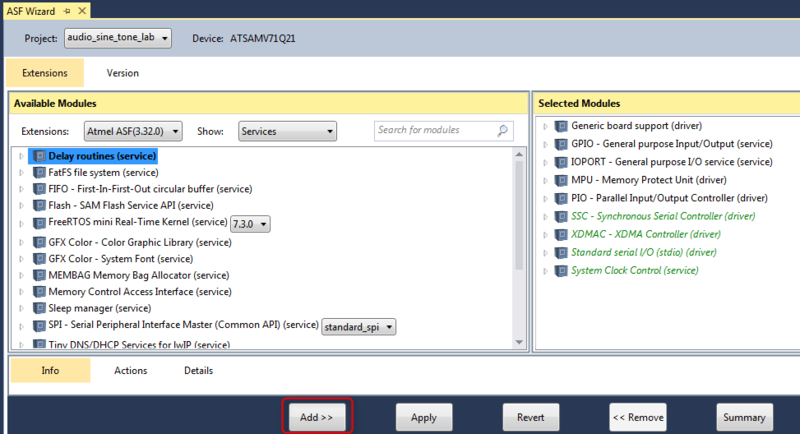 Click Apply to add the selected ASF module to the project. While the added modules are being applied to the project, information is prompted mentioning the modules added. Click the OK button on the information prompt. 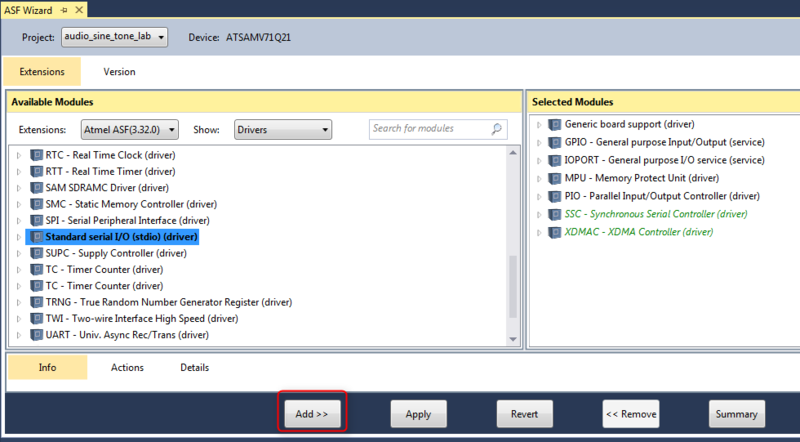 Instead of selecting the ASF modules from the drop down list, you can find and add the required module by typing the name in the search text box. 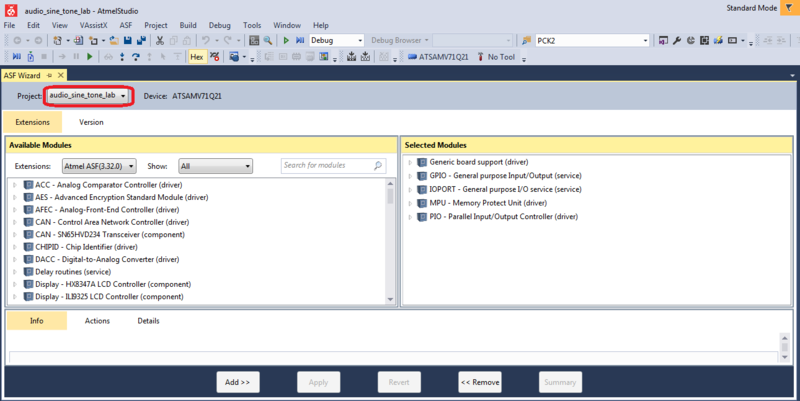 On the right pane, Click on Solution Explorer and observe that the source files for the selected modules are added to the project.